Use realia to explore vocabulary and expand background knowledge. Whether you teach preschoolers or high-school freshman, most students learn best through doing. When introducing new vocabulary or building background knowledge, use a concept I first learned in library science studies. Realia are objects that can be used as teaching aids, but were not made for the purpose. Introducing new vocabulary or ideas by showing -- and allowing students to touch -- an object solidifies the definition in their minds. Keep collections (or photograph replicas) in class as sources for future use of learned terms (add to a word wall). Encourage students to use the new words in their writing. Click here to go to the Education World Language Arts message board and share your experiences, questions, and suggestions about literacy. Here's how simple it is to bring realia into play with students reading at a 4th grade level and higher: Use My Side of the Mountain, by Jean Craighead George as a classic novel and introduce simple objects like pinecones, animal skins, flint, and steel. Invite a local zoo to visit with a falcon. Present words and associated objects together, and allow students to talk about similarities and differences between the unfamiliar object and the objects they know. Let them try to start a fire with flint and steel as an avenue for a discussion on the difficult tasks the book's characters faced and how they survived. Use the same concept when reading an inner city survivalist story like Slake's Limbo, by Felice Holman. Bring in subway tokens, newspapers, and a map of the New York subway system, and form small discussion groups to explore how students would cope with such a situation. Start a "realia collection" with other teachers, reading specialists, and your media specialist. Public libraries or interest groups such as Camp Fire Girls or a local farm or business also are great sources of realia. Use group readings and group discussions. Plan small group activities with the goal of building engagement and comprehension. Use flexibility in placement -- vary groupings by knowledge of subject, skill level, interest and task -- and make sure more passive learners don't get lost. Give students varying roles to showcase their strengths and support their challenge areas. * Explicit Strategy Instruction Effective Teaching of Reading * The Clarifying Routine: Elaborating Vocabulary Instruction, by Edwin S. Ellis, University of Alabama, and Theresa Farmer, Oak Mountain Intermediate School, Birmingham, Alabama * Comprehension Instruction: Research-Based Best Practices, edited by Cathy Collins Block and Michael Pressley, Guilford Publications, 2001. * The Fluent Reader: Oral Reading Strategies for Building Word Recognition, Fluency, and Comprehension, by Timothy Rasinski, Scholastic, 2003. The following activities can trigger understanding, model cooperation and thinking about what you read, connect oral language experiences with text exploration, and practice sequencing and main idea concepts. Divide text into manageable chunks to be read together and digested. Use "natural leaders" to include less engaged students by asking for their input and discussing unfamiliar terms. Teach value in every contribution and give less involved students a chance to verbally summarize to the class. Use ability-leveled learning, so every student gains new knowledge. If you are studying animals, have a variety of reading materials available (books within a grade level range of two or three years, magazines, encyclopedias, and so on.). Allow each student within a group to choose materials within their instructional level. Require each student to share one unique fact they learned, including explanations of vocabulary. Let the group build a mini-report together, based on members' findings. 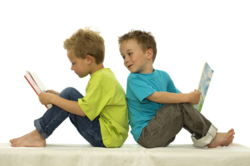 Pair students by fours or fives and have them read a short story together several times throughout a week (using choral or paired reading). On Friday, have a "pass the stick" storytelling festival. Each student tells part of the story, and passes his or her stick to the next person, who then tells the next part of the story. Designate a group helper to protect the story's original sequence. This strategy easily is applied to a study of legends, folktales, or complex novels. Finally, remind yourself and your students daily that reading is an active process and that the power of reading is in what they take away when they close the book. Celebrate contributions by all and strive to connect text your class reads to their understanding of the world. Biographer and author Elizabeth Drew says, "The true test of literature is, I suppose, whether we live more intensely for the reading of it." If we do nothing more than open this door for students, we will create life-long readers and life-long learners. Known as the "Literacy Ambassador," Cathy Puett Miller has a library science degree from Florida State University. Her writing appears in such print publications as Atlanta Our Kids, Omaha Family, and Georgia Journal of Reading, and online at Literacy Connections,Parenthood.com,Education World,Family Network, and BabyZone. Be sure to visit Cathy's Web site at www.readingisforeveryone.org. Click to read a complete bio.